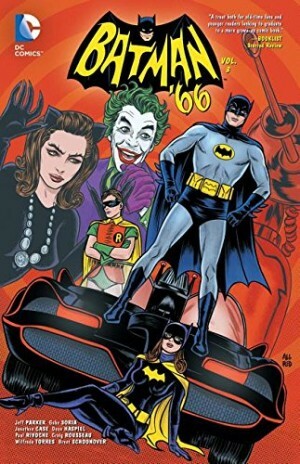 Batman ’66 has been quite the astonishing success for DC, running for over two years as a monthly comic, and prior to that as a series of online presentations. 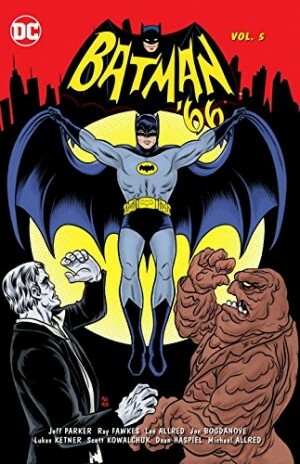 Who knew there remained such an audience for new stories of the camp antics presented in the 1960s Batman as seen on TV. 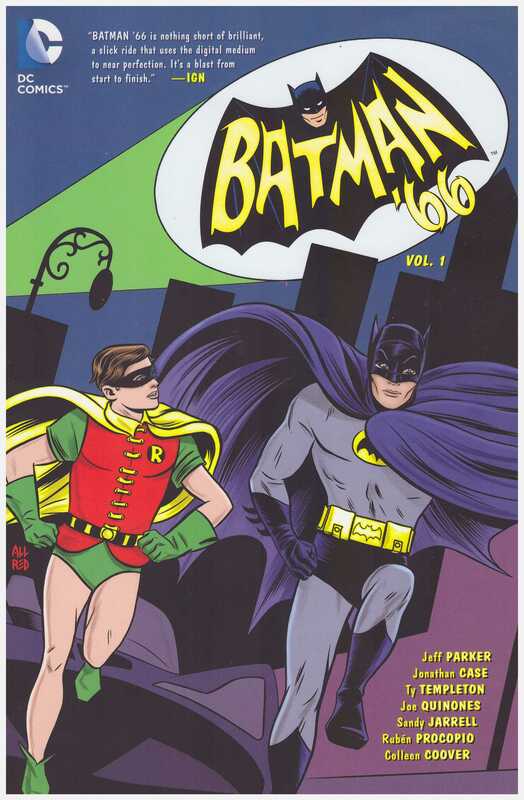 Jeff Parker’s version of the tongue glued into cheek mood of that series is note perfect, down to the shots of Batman and Robin climbing walls only to have a celebrity poke their head from a window and crack a corny old joke on viewing the pair. There’s also the daft expository dialogue, the incredibly unlikely escapes, the hugely inflated sound effect captions, and the ridiculous situations. 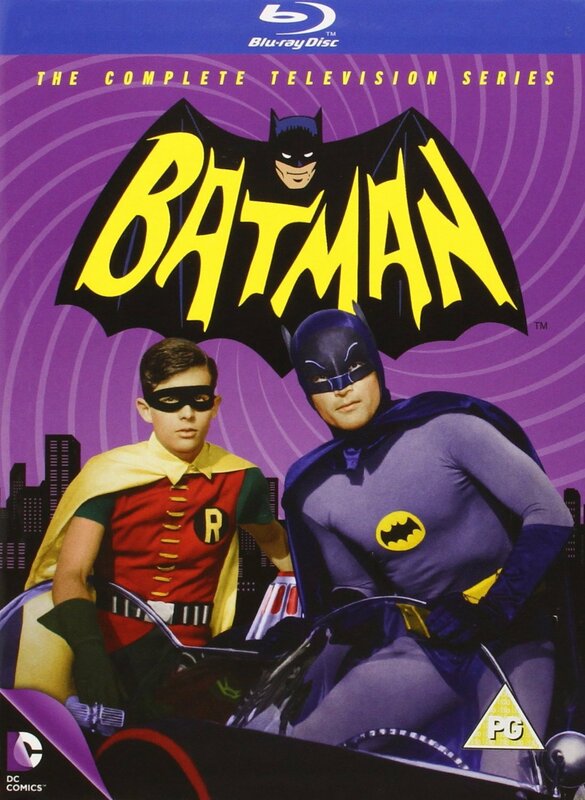 Batman and Robin fly to London in costume, disembarking behind the Beatles with the airport crowd screaming for the caped crusaders. Awaiting them is the specially commissioned British Batmobile, a pimped-up Rolls Royce Phantom with bat logos. There is one aspect where the comic scores considerably over the TV show. 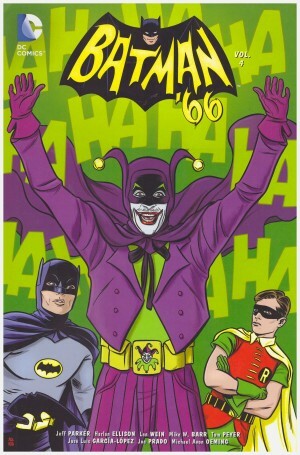 It can’t provide the laughably cardboard sets that wobbled at the slightest impact, but does have the equivalent of an unlimited budget, so there are scenes of Batman fighting the Riddler on a biplane, Penguin floating an enormous iceberg into Gotham harbour and the Mad Hatter flying giant top hats around London. The budget also permits Parker to team villains, or set them against each other, something that never occurred in the TV show. In the opener there’s Catwoman aiding the dynamic duo in bringing the Riddler to book, and Penguin and Mr Freeze have a set-to thereafter. There are several artists used, all adept at producing likenesses from the original TV show. Ty Templeton delivers a great Burgess Meredith as the Penguin and Joe Quinones supplies Cesar Romero’s Joker complete with the moustache he’d not shave covered in white powder. It’s the excellent Jonathan Case, however, who opens the book and contributes the most pages. Rubén Procopio and Sandy Jarrell’s cartooning doesn’t work as well as the naturalistic artists, with Jarrell often very sketchy, but both capture likenesses. Colleen Coover has an attractive cartoon style, but isn’t as adept at likenesses in her tale of Batgirl and the Eartha Kitt version of Catwoman. Despite retaining the flavour of the 1966-1968 televised Batman, Parker feels free to introduce characters created after the show aired, so we have Dr Quinn of the Arkham Institute for the Criminally Insane. 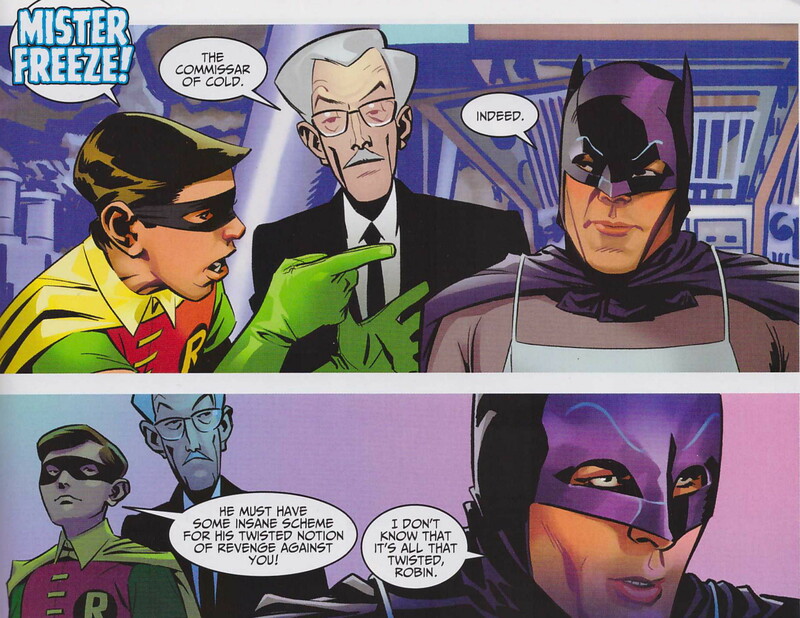 Yes, the pompously named Gotham institutions also carry over. 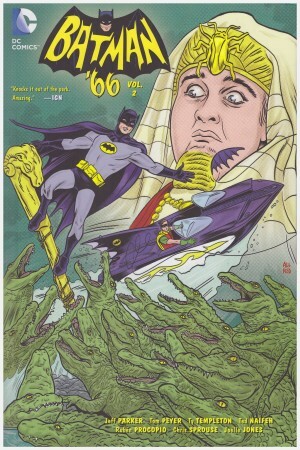 If you believe too much Batman product has dwelled on the dark side for too long, then Batman ’66 is the perfect light-hearted fun for you. And there’s a second volume. Then there was a third, and a fourth, and by the time there were five that was enough for an omnibus also.